"How Dinosaurs Really Became Extinct"
This was just too funny not to include. 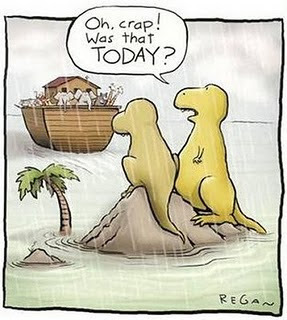 I've been studying Noah this past week and when I saw this comic on Rachelle Gardner's blog, I knew I wanted to use it in this blog post. Perfect! I had run out of womanly/coffee time/start-my-day-with-a-thought kind of devotionals to use each morning as I read my Bible before heading off to work. Feeling a little lost and out of sorts about that - probably because I'm relying too much on the devotionals to give me insight rather than God's Word alone - I decided to try a technique that my sister learned at a seminar on how to study the Bible - read it through chapter by chapter, and highlight only one verse that stands out in that chapter. After reading completely through the entire Bible, take each verse that was highlighted and gather them all to one spot- and see what connections can be made. So I started. It's a challenge some days to pick only one verse that jumps off the page at me. I got into the account of Noah and the ark, and it was fascinating to read it as a story from start to finish rather than just a verse here and a verse there. It was because of this continuity that when I got to chapter 7, I was feeling the weightiness of what went on as the flood came. How horrific it must have been for Noah to realize the devastation that was going on around him as he and his family and the animals safely got into the ark. How thankful he must have felt that he and his loved ones were spared, but how he must have ached for those left behind, knowing full well their fate of doom. It was then that I came upon this sentence, "For forty days the flood kept coming on the earth, and as the waters increased they lifted the ark high above the earth." Wait a minute. I read it again to make sure I had it right. "As the waters increased...they lifted the ark high above the earth." Wow. The same waters that were destroying, killing, desecrating and cleansing were also lifting, saving, rescuing and floating. The force wiping out one nation was preserving another. That's a powerful contrast - one that hit right at my heart. God and His ways are not about only what we can see. In the midst of horrible, tragic, unanswerable events, He's able to use the devastation to replenish. We need to trust Him and and to remember that when we're in the thick of it, there's more going on than meets the eye. Our line of vision stops at the horizon; His eyes roam over all the earth. Aren't you glad we have such a big God?